I am sharing my second BLACK & BOLD photo and style collaboration series with my talented friend and Seattle-based photographer Kamrin Dishman of KNDM Co. This series aims to inspire how to showcase your monochromatic wardrobe in the spring. Just because spring is approaching does not mean you can't make a bold statement. And I'm showing off just how to do it. In my second look of the series I'm wearing a look that is dressy enough for date night, a more formal day at the office or if you're just feeling sassy and girly! This look not only makes a statement but it's extremely comfortable no matter what the occasion is! 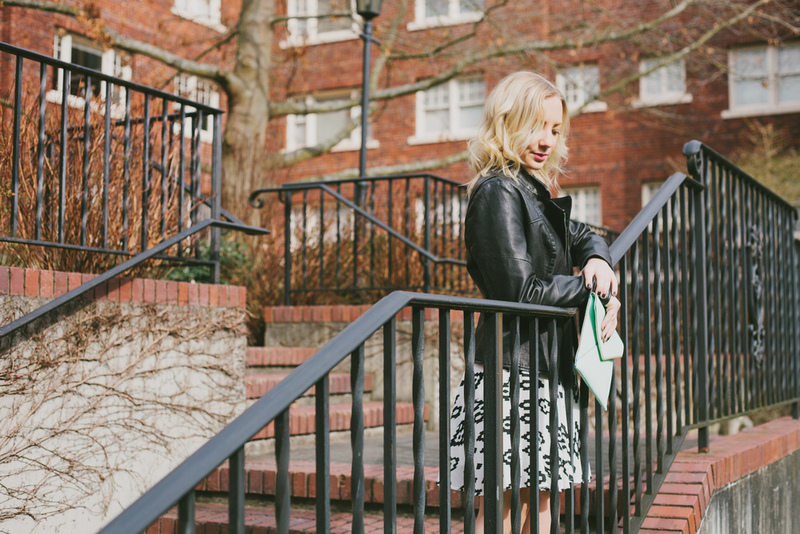 I'm wearing a bold patterned Nordstrom dress paired with my favorite leather jacket from Urban Outfitters that not only fits snug but adds a little sass to the outfit with it's defined lines/front jacket flaps that can be worn open or zipped up. I decided to rock a statement necklace with this outfit to really tie in the bold print of my dress and to compliment the colors in my new favorite accessory...my Rebecca Minkoff exposed zipper clutch in wintergreen --my favorite staple for spring and a show-stopper of an accessory, I really can't get enough of exposed zippers at the moment! I wanted to go simple with the shoes so I opted for zip up (more zippers, yes, I can't say no) black ankle boots courtesy of H&M that go with just about any outfit. Lastly, I complimented my outfit with that extra bold pop...a magenta lip, you can never go wrong with this spring must-have lipstick color that makes a darker look a little more feminine.